Someone asked me tonight what my passion was. I had to think what my answer would be. And then I had to think about the question itself. When I think about how many years I let slip by, just coasting and getting along with folk in this western world of almost unlimited freedom, I’m a little ashamed. We can do what we want, within the means given to us (and let’s face it – we have a lot going for us, no matter how poor we may be), and yet we squander it away. *I* squander it away – watching TV and relaxing at the end of the day. Day after day, TV program after TV program can slowly swallow your days. You can be the frog in the cold water, just sitting there – *relaxing* – while The Man turns up the burner on the stove. I tried to remember what it was that made my blood boil; what it was that got my wandering attention; what…thing….hammered a nail in my hand. Even though what I just said was true, I thought some more. It’s true, as far as it goes. When I left the assembly line to the computer keyboard, I was amazed at technology and what it could do. Still am. It excites me, gets my ADD thoughts twirling around in colliding bits of wonder. Eventually though the coloured lights diminish, like mental snow globe flakes settling to the bottom. Sooner or later you come to the limits of what’s possible and available now in technology and boredom pokes its head in the door, sniffing at your discontent. The distracted prey might not be aware when it makes its way fully in, depositing a big steaming pile of anguished disgruntlement. One remedy for boredom: TV. Books. Those have always worked for me. Abe (see blogroll – Word of Abe) painted a picture of one of his motorcycle trips, and a moment that put everything in crystal clarity for him. I’ve had moments like those. They’re usually so rare and they go by so fast that it’s hard to hang on to them. I remembered attending an Anglican cathedral night gathering, with the glow of warm lights only appearing at the altar end of the massive pillared place. The outer edges and walls were lost in darkness. The uniquely beautiful and decidedly untraditional music notes produced by a variety of wind, brass and electrical instruments, combined with harmonious voices wafted throughout that place, curling around pillars and up into the darkness of the invisible stone ceiling, making the heart swell with joy. You couldn’t escape it. I didn’t recognize any of the music or knew the words, but I remember just standing there, bathing in it, hoping it would never end. None of the songs ever ended abruptly. The instruments would cease, and the voices would slowly collapse into a fading harmonious hum. In school, I joined the band and played various percussive instruments: drums, timpani, bells and the xylophone. Collectively our band never achieved the same joy of that Anglican church gathering, but – we created our own joy, just different. Not every song was dynamic, and some were downright hideous really. Occasionally our band leader would pick a song and I knew – just *knew* – it was right. It would make the heart thump hard, and you could almost visibly see a change in the musicians as we did our level best to perfect the song. The piano lessons I had taken since I was small kid had culminated in the achievement of the passing of the Grade Nine Royal Conservatory exam. I was proud but it didn’t move me that much. I figured piano wasn’t my deal. I stopped playing, I thought, for good. Until I took it up again when I played at the front of our church with an absolutely awesome and gifted guitarist. His exhibited an intent and energy to move out of the shallow waters and into the deep dark waters of creativity. This drove me until I finally found a pure joy in a creativity of my own. We sparked off of each other, there at the front of that little church. There were other singers there and a drummer as well but on so many Sundays it was him and me, going off into riffs of music that were never in the original scores of the music we played. John created some of his own songs, and we worked them out with abandon and delight. We would extend a three-minute song into fifteen minutes, just improvising and playing back and forth. First, he would take the lead and I would provide a backdrop of musical harmonious noise; then, he would drop back and provide rhythm while I walked up and down those keys, trying different things and riffing as if no one else was in the room. I remember smiling. I remember looking at the congregation and seeing them with their eyes closed. There’s a scene in a movie called Rock Star, where Mark Wahlberg (who plays the rock star “Izzy”) is standing next to Jennifer Aniston with a group of people, and he throws his head back and bursts out in the raunchiest of singing notes. I remember sitting in the theater and feeling shivers go up and down my spine in focused empathy. I considered the question. Then, “both”. I really want to play again. I don’t have a piano. That can and will be remedied. The seduction of the couch continues to beckon me, as it does so many other people. The impulse to relax and do nothing, except complain on occasion, needs to be fought with rushing blood, from the depth of bone. I have fallen into the trap of minute concerns, the constant frustration of attempting to sweep up inconsequential marbles: what will I do on Friday night, time to pay some bills, get my dry cleaning, should I hire a housekeeper, hope there’s time to read the newspaper before heading to work, will I gain weight if I put some cheese on my salad. The noise of minutiae drowns out the howling wolf who just needs to *run*. I wonder: if we’re not pursuing passion, are we just putting in time? What passion have you let slide? I put mine on hold when I became a mom .. I never dreamed 21 years later it would still be on hold. Is it just too late to pick it up again? I wasn’t a girl who dreamed of white weddings and picket fences. I was traveling the world, singing, and doing humanitarian work. I had this amazing, challenging, meaningful, life. Then, suddenly, I found myself married with a baby, which was truly an accident, not something I intended. I didn’t know how to be a wife or mom. I’d never really even THOUGHT about it. At the time, I had this acute awareness of what I’d lost. I loved my husband and son, but I felt like I’d lost my passion, like I was living another persons life and not my own. Here’s the thing: I regret the moments I lost to wistfulness and wishing. I regret that longing I felt to return to something that was past. I regret it because it robbed me of the present I was living, of those moments I’ll never recapture with that beautiful baby boy and my husband who was fighting to take care of us and needed a wife to be in it with him, not pining away for the jungle or a stage to sing on. It took me a long, long time to want the life I had. Eventually, I was able to return to the things I loved and lost. I went back to the jungle. I sang again. And I grew to be a person I never imagined I’d be. I love my life. It’s become this amazing blend of family and home and adventure and learning and I feel like I’ve finally come back to myself. I’m not putting in time. I’m living my life full out. I’m IN it! I see you living a passion right here, my friend. You’re writing again. It’s as core to you as music and breathing, I think. You can pay the bills, read your newspaper, and “run.” It’s not one or the other. Took me forever to figure that out. You know, I’ve been complaining to anyone would listen about my day job lately. I’ve complained way too much. The answer for me anyway is not to live in the now of a job I’m beginning to resent, but to go after the passion that really drives me. It took last night, and seeing the film “The Runaways” to figure that out. I should have mentioned some other moments in the blog; like the time we attended an all day, all night outdoor Woodstock-like rock concert featuring multiple bands. That whole experience meant so much more to me than just listening to music. And when AC/DC exploded on stage with “Thunderstruck” – it was one of those moments that drove my heart beating so very fast. Music has always been there, driving me, or when I’ve been in the driver’s seat, allowing me to plunge into abandon. I just didn’t fully recognize or appreciate it. That last paragraph you wrote – you’re right. I wrote this blog filled with passion, and it occurred to me that whatever I do – music or writing – must not be done in a half-assed way, but with total focus and commitment. Focus is difficult for me and distraction is an enemy I’ll always have to fight. Apathy is not a concern – though i know for many people it’s a companion that comes in, puts its feet up and like the unwanted unwashed guest, never goes away. Maybe angst is its opposite, its implacable enemy. Anyway. I’ve got the beginnings of a plan now. Before last night, I felt stuck behind a porous fence, able to see the open road but not able to get to it. Photography and writing are my passions. I’ve done something about the photography part and am trying to figure our how to push myself with writing. I still want to write a book because I think it’d be cool and fun. What to write about and would I get publshed are the questions that linger in my mind. They don’t stop me fueling the passion…just linger. Everyone needs a passion…everyone has one and are sometimes just afraid to share it, express it and pursue it for fear of failure. In my opinion, they’re limiting what kind of life they can have. I’m glad someone asked you what your passion is….a topic that always creates an interesting discussion. So good to hear that you went after your passion for photography and are trying to figure out the details around writing. I’ve lingered too with some of the questions you talk about, and I figure that I’ve lingered way too long. There are two opportunities facing me in the writing arena, both of which I see as challenges that will help. The first happens this week, when I have to do some traveling and am taking my laptop with me: I’m going to work on the novel that’s been bubbling in my mind for the past two years. This morning, I actually found the ‘book’ I started about a year ago. I have been reading it over since then and adding to it. I had looked for it recently but couldn’t find it…obviously didn’t look good enough. Having it before my eyes again has renewed my sense of wanting to finish it. It’s not a fictional novel but recount of my time since grad school and moving to Oklahoma. I still have doubts about where it can go but in the meantime, I’m having fun with it. Thanks for sharing that site though. You’re welcome. I hope you do really give it a good go. Often, I find, writing is more about perspective than anything else, and making sure the reader can follow along with you when you give them your story. Hey. I like this blog. It has my name in it. Like me, you have a few creative gifts. There are times when I find my brain bouncing from thoughts of music, to writing, to…building a strip-wood kayak…and trying to find the time to do anything. Here I am, with a full studio insde of my shop with recording capabilities, microphones, instruments, and…why am I not in there EVERY DAY? Actually, I am really okay with the state of things. I actually started off my adult life pursuing a career in the arts–I graduated from a commercial art college and was on my way to becoming an illustrator. I was also taking care of a small child and a…wife. I had to face the harsh reality that in order to become an artist who makes a living at it, I had to do the art that someone told me to do, and I had to starve. I need to pay the bills! When I graduated from college and began my career as a forester, I still believed that passion in what I was doing was the most important factor–I was passionate about my career and quickly burned out on the reality of it all. I took a break, pursued some other paths, then ended up right back in the same career with a different viewpoint: We all need a livelihood–a way to pay the bills and move through life in our society, caring for our children and preparing for our retirements. But we also have our passions. To me, when my passion is not my livelihood, it is a much more relaxing endeavor. I am totally with you on this one. Being passionate at work can KILL you. Work is so much more easily done if you like it, but being passionate about it can turn you inside out. I had a friend who could have been a professional fishing and hunting guide but he chose not to. His reason was that it would become a job…and he preferred his time in the wilderness be pure recreation. A different perspective helps immensely. A job is a job, but it is really just that–a job. YOU HAVE A RECORDING STUDIO???? Wow. Last night when I finally realized what direction I needed to take with music, I gave some thought to the fact that I need a fairly soundproof place where I could blast away on my piano and sing without having to annoy the neighbours. And that means – for me – finding a different place to live. You know what? I’m going to have to pay you a visit, I think. Just so that we can jam at some point. Yours is a fascinating evolution. I knew how fiercely you felt about forestry from some of your earlier blogs – didn’t know how it fit into the overall picture until now though. Your last line kind of says it all for me, I think. I don’t want any “what if’s” floating around in my head. I am going to play that piano, and I’m going to find others to play with me and we’re going to create some stuff. We may never go commercial and that’s OK. I don’t care. As long as we play. Yes, my brother and I built a recording studio within the walls of my shop. My shop is large–about 4,000 sq ft, I think. The studio is built within the shop as a separate building, which is pretty cool. It’s small, but I can fit a full band inside of the tracking room. There is a separate room with a glass window and about 6 inches of air space between them both. My brother moved away and took the recording software with him, but I still have the soundboard, mics, and everything else I need to record songs. Lately I’ve been feeling a little more motivated to get the remaining things I need to really amp it up, like a new computer and software package and a real, acoustic piano. I have a nice new Electric Piano with some great sounds, but as you know, there is nothing like the sound of an acoustic piano. I’m looking at some old uprights as I do not have the space for a grand (nor the funds to purchase a Steinway!). About 10 years ago, I self-produced a CD that was just me singing and playing an up-right. It was a whole lot of fun, and I sold all of the copies (I think we only ran about 500). I have another solo-piano CD ready to go. It was recorded on a full-size Steinway in digital stereo, and I had it mastered at a great studio in Portland. Now? I just need to finish the artwork and then shell out the dough to run about 1000 copies. I just need to keep things in perspective: if I decide to try and “go for it” and make it as a recording artist, then I begin to get frustrated. There are millions of talented people and the internet is their showcase. However, if I do as you say, and create some stuff and play for the love of it, I can retain the fun. And the passion. It would be awesome to jam with you. Maybe we should start a band, eh? So…are there some good piano spots to play up there, or what? That all sounds so great, Abe. Really does. I don’t know of any piano spots up here – but that doesn’t mean (of course) that there aren’t any. Just that I’m not aware of them. I’ve never gone out to look for any. There are a few places that feature indie artists though, if that helps. Places like The Drake Hotel (I’ve heard some pretty cool music coming out of there on occasion). What kind of electric piano do you have? Because that’s my first purchase. I want an instrument I can haul around on occasion when necessary. Makes it easier to get a group together. C) has a nice feel, ie heavy, weighted keys. E) “Outs” for plugging into a PA system or for recording directly. This Korg SP 250 is it. It has a tubular stand that is good for sitting at, the best piano tones I have found, and even though it is heavy, I can lug it to events if I need to (unlike true electric pianos), as it lifts right off of the stand. The keys have a great feel, and even though the instrument bank is limited, I can make play it and it sounds good. You can puchase cheap keyboards with thousands of sounds, but you have to look very hard for a “piano” sound that is good. See if you can find this in a music store–I bought mine for around $1000 which is very reasonable for something like this. You can check them out online, of course. But if you can find one somewhere and sit down and play it, you will be hooked. Thanks for giving such specific details on the Korg – that’s the kind of thing I’m looking for: portable -and it’s *got* to have weighted keys, plus outputs for recording (gotta keep my Mac happy) or for an amp. When I played with my buddy John we had a similar piano – a Roland FP8. Multiple sounds are a “nice to have” deal, relative to the rest of it. Oh yeah, and you can plug your headphones into it and voila! no more sound to annoy your neighbors, and awesome stereo right in your ear-holes. Sweet! Unfortunately that would work for me, but only if I wasn’t singing. Hard to keep those notes if you can’t hear them. Plus I like playing along with the stereo system so there you go. Now if you tell me there’s audio inputs so that you can do that too……well that would be just sweet. Before I bought the Korg, I purchased a small Behringer mixer. It was very inexpensive and allows me to sing through good mics, mix in stereo inputs (like an ipod or a laptop) and output in various formats. I can add reverb to my vocals, etc. I recorded through that right to a tiny Roland digital multi-track recorder. That was a very small, portable set-up. My passion is to lead a normal life. Are we there yet? Actually, I was an artist in high school and college. Painting was my favorite. Haven’t painted since 1989. Except my house. Yikes! It’s never too late though, right? I have a few friends who are on the job as you are and so am a little bit acquainted with how offside things can get. I don’t know. Maybe if you (or they) worked in a smaller town where nothing ever happens – except when Ottis staggers in, demands the key for the drunk tank and locks himself in. *grin* Or does Mayberry places ever exist anymore? My current passion is to regain my passion. I sort of remember what it was like to have a passion. Blogging comes close to that at the moment. I like the way you talk to yourself on your posts. It would be great, actually, except when I get into arguments with myself. Hard to tell who’s winning really. You know – I think your passion for writing is coming through loud and clear. It’s certainly why I’ve subscribed to your blogs. I think too, that there’s a natural progression here: passionate bloggers finding other equally passionate writers to read. If they’re not passionate then what they write is not nearly as enjoyable to read. I haven’t read any of the other comments yet. I’m just going to charge on ahead in my ignorance of what has already been written so I won’t be swayed. I was a drummer way back when, and then life/marraige/family/business took over, and there just never was an opportunity to do it. The thing is about drumming – it makes a lot of noise. So, you need special living arrangements in order to partake – either a lone house in the country, or a garage with 12″ soundproof walls, or access to a recording studio whenever you want. I’ve never had any of those. I know you can buy electronic drums that you use with earphones, but they just aren’t the same. You can’t rear back and just wail on them! But man, do I ever get the urge. And it’s hard to resist. I don’t know how many times my brain has said “I want to go out and buy a full kit right now!” And then common sense / reality prevails. However, one day ……… one day ………. That’s always a good idea (in my opinion) to just write out what first occurs to you without reading the other comments first. It’s what I do too. Yes, I’ve seen those electronic drum kits and have played on them a bit – you just can’t get the same satisfaction from playing them. Obviously you need a full kit, and you definitely need a soundproof place to play them (or a remote place). You need it more than I do, and I really need some place where I won’t bother the neighbours with my singing and playing. Back when I lived in a townhouse, I occasionally had a bunch of folk over and I played the electric piano while others played their guitars and we all sang. On a warm summer night I’d leave the back door open and some of the neighbours would come by just to listen. It was pretty cool. I think I’ve just been through this on my blog but, one of the passions I’ve let slide is writing. I let it slide for a LONG time but, I’ve started again with my blog, and I hope to continue with that, as well as finding other places to write. I enjoy it, there is no question about that. There are other passions I’ve let slide as well, my passion for life in some ways but, again, I’m trying to get them all back now. It sounds to me like you should definitely get that piano for yourself……of course if it means having to buy a new house so you have somewhere appropriate to play it, I may have to think about that a little harder, hahaha. I mentioned to this to Roger (using different words) but…I find I only subscribe to bloggers who are passionate about writing as you are, because it really shows in the quality of what they write. Someone who’s only here to make a half-hearted attempt becomes pretty obvious after a while. What I’m trying to say is that you’re very good at what you do – and that for me is proof of your passion for it. If you’re going to get the piano, it only makes sense to go all out and get the house to go with it, right? Don’t do it half assed now, haha. 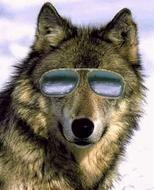 Just a heads up, a wolf in shades is about to be unleashed on a bunch of unsuspecting sheep in my comic strip. I wonder where I got that inspiration… Look for the strips to launch on 3/24/10 (www.sheeplaughs.wordpress.com).